Pilots are inherently drawn to puzzles; all types of problem-solving, and flying along playing the “what-if” game are characteristics in their nature. They share a fascination for anything and everything about airplanes and flying. 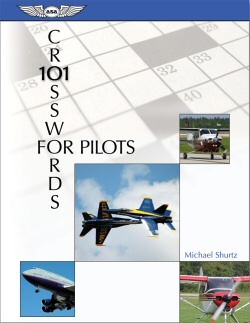 The over 6,000 clues used in 101 Crosswords for Pilots will provide hours of enjoyment for pilots and aviation history enthusiasts, stimulating recall of stored knowledge as well as satisfying that innate yearning to learn more. Each puzzle's clues have references to the aviation knowledge source they were derived from. Crossword-puzzle creator Michael Shurtz became a private pilot in 1980 by bagging groceries to pay for flying lessons; later he earned commercial and flight instructor certificates with a multi-engine rating and has taught mountain flying techniques in the Rockies, towed gliders, flown volcano tours and powered parachutes in the Pacific Northwest. As a flight instructor, Michael has always looked for fun and interesting ways to engage his students. Michael has a Bachelor of Science degree in geographic information systems and cartography. Foreword by Greg Brown, photographs throughout, with FAA References for the clues.